It made me laugh out loud, and I hope you will enjoy it, too: http://goo.gl/pRAQx Well done, Simon!!! First, an update on my computer situation. Stefano fixed it yesterday evening, and I have to say that the new superfast groovyzoomything that he installed in its belly seems to know what I want to do even before I begin typing…in fact, I can barely keep up with my computer now…Amazing. Ah, before I forget: I didn’t check my e-mail during the frustrating, slow-as-a-snail laptop period, so I found 120 or so messages lying (unread) in my e-box yesterday evening. Yikes! It will take me a while to go through all of them, so I just wanted to say that if you have written to me with a question or two but haven’t heard back yet, please send me a reminder…Thanks! The abstract concludes that These results reveal a significant selective induction of apoptosis by PO and suggest a significant in vivo effect against myeloma. Well. Makes you wonder…doesn’t it? Any ideas or thoughts or suggestions? Should we be running out to buy some of this wondrous dandruff shampoo (without any parabens, of course) or…? I am still on the slower-than-a-snail laptop, since Stefano, my computer guy, has been too exhausted the past couple of nights to put my super fast fabulous computer back together. He said he would do it this evening, though. Phew! So I don’t have any research-based posts, but I do have this, thanks to Hanna: http://goo.gl/VS2rp Hehe. Enjoy! This afternoon, while I was in the kitchen making an apple pie, Stefano was in my study updating my computer. At one point he came downstairs, looking both crestfallen and upset. He told me that he had installed a new poochywoochy inside my computer, which meant he’d had to unplug it, of course. Well, when he plugged it back in and turned it on, he heard a crackling poofy noise and saw that the transformer had burned out. Argh! To make a long story short, we hope that no harm was done to my computer, and that fixing the problem will just be a matter of changing the dead transformer (I will go buy a new one at some point tomorrow)…In the meantime, I won’t have access to my computer, my research or my e-mail. Eh. Whatever you do today, steer clear of poochywoochies! And finally, here’s to swigging, guzzling, and gulping life!!! A new exterminator of myeloma cells!!! Anyway, the link will take you to a paper that was presented at the December 2010 ASH conference. 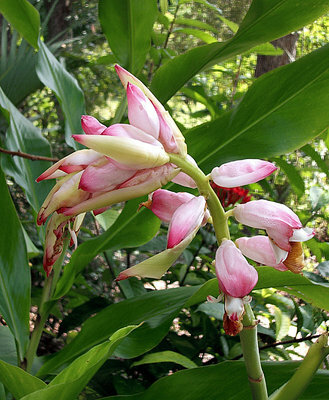 Cardamonin is extracted from a lovely plant called Alpinia katsumadai (see photo), which belongs to the ginger family (hmmm, quelle surprise…NOT!) and is widely used in traditional Chinese medicine. But it also strongly induced cell apoptosis…That means that it killed myeloma cells…all by itself…Yaaaaaay! Oh, I just read in PubMed that cardamonin also has antiviral activity. In fact, it STRONGLY inhibits the H1N1 virus, see: http://goo.gl/Bxpvp Well, I definitely need to do more research on this compound…when I have a bit more time…Still, from the little I have read this morning, it all sounds very promising, so much so that I hope this new substance receives a lot of attention! Hmmm, I wonder if it is commercially available? I mean, if it is used in traditional Chinese medicine, it must be…okay, need to check that, too. But now I have to rush off. Take care, everyone…especially you, Paula! Well, I will be giving you the news, good or bad!, at some point after the middle of March.